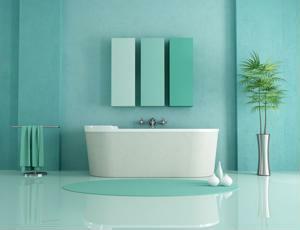 If your bathroom is a bit drab, think outside of the box when redesigning it. Traditional black and white tile may be tasteful, but you might want to make your facilities memorable with eclectic choices. Perhaps you do have one of those not-so-interesting bathrooms. If the tile floor hasn't been updated and the walls are simply off-white, you can do a lot to spice things up. A recent Business Day article discussed how a Scottish hotel has done just that. The basement of the Newmarket Hotel in St. Kilda, Scotland, closely resembled a dungeon before Six Degrees Architects renovated it. "It felt like a giant tomb, with only the concrete walls, floor and ceiling," said Mark Healy, a director of the architectural firm, according to the source. The hotel decided to transform this space into their decadent Cellar Bar. The room's designers let their creative juices flow, making a lounge area comparable to that of a swanky club, complete with Persian-inspired carpeting, velvet drapery and golden mosaics. The Cellar Bar's bathrooms show this same pizzazz. Six Degrees held a competition among its architects, resulting in the completion of truly eclectic facilities. One of these is reminiscent of the Paris Metro. Another is referred to as the "birdcage." A combination of copper pipes and mirrors on the wall make this particular room seem infinite. Just as these architects transformed a banal basement into an eye-widening masterpiece, those who want to enhance their lackluster bathrooms may do so by getting similarly creative. By shaking off the image of a traditional bathroom, individuals can achieve a truly eclectic design. Houzz.com shows how instead of typical painted or tiled walls, a bathroom can be lined with brick for a unique look. Additionally, instead of using the classic white or pale hues for the space, choosing darker, denser colors for a bathroom may make it intimate, albeit different. Don't stop yourself from painting a wall dark blue or changing out your old shelving for a striking glass vanity. With additions like curtains of colored lace, an oriental rug on the floor and a piece or two of modern artwork on the wall, your bathroom will be one-of-a-kind. Offer oriental-style robes on wall hooks and daintily-patterned towels next to the sink. These out-of-the-ordinary choices make for a truly distinct room.